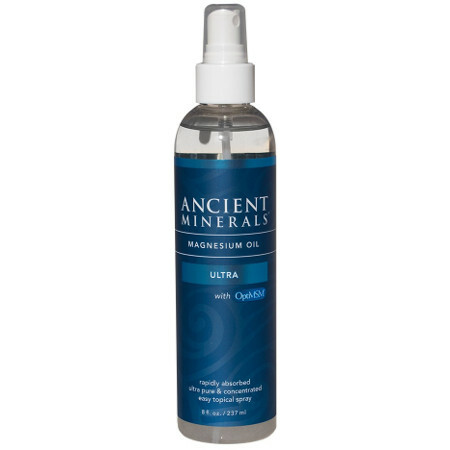 Ancient Minerals Magnesium Oil Ultra is a next generation magnesium formula that incorporating the unique synergistic benefits of MSM and magnesium. Ultra pure magnesium from a remote source untouched by man made pollutants. Utilises premium distilled OptiMSM, the world's purity standard for MSM. Contains the purest magnesium oil and msm. Easily applied to the skin as part of your skincare regime. Support magnesium levels through the skin. Supports the skin and body. How much magnesium and sulphur is in the Ultra Formulation? 1.6g elemental magnesium per fl oz. 3.6g of MSM (OptiMSM) per fl oz. Magnesium oil isn't actually an "oil" it has the texture of oil due to its high saturation of magnesium chloride in water. Spray directly to the skin and rub in until absorbed. For best results we recommend applying to the torso as it is the biggest surface area of skin and allow a few minutes for it to dry before dressing. Should you experience irritation we recommend diluting the spray with water to reduce strength. How do I know the source is pure? Ancient Minerals ultra pure magnesium oil is extracted from the Ancient Zechstein Seabed in Europe, 1600 to 2000 meters deep in the interior of the Earth. It has been well protected for the last 250 million years from man made pollutants making it the most pure magnesium oil in the world. Every bottle has a mark of purity on every bottle of Ancient Minerals. TIP: Check the source your magnesium supplement or topical application comes from. Look for magnesium oils sourced from remote areas far away from man made pollutants and toxic heavy metals.